Despite the aborted coup that momentarily threatened Boehner’s re-election as Speaker in January, House hardliners have described the past few months as Boehner’s finest. And why not? He gives them every opportunity to take the stands they need to secure re-election, while ultimately cushioning them from the consequences of economic catastrophe. Moreover, there are few credible candidates waiting in the wings—the threat posed by the ambitious Majority Leader Eric Cantor, which hung over the 2011 debt ceiling negotiations, has receded—and even fewer who would actually want the job. Bernstein thinks “it’s extremely likely that most House Republicans blame the radicals, Ted Cruz, and Jim DeMint a lot more than they blame John Boehner.” Again, I have to keep scratching my head. I understand Bernstein’s narrow point about the Congressional GOP, but from the country’s point of view, Boehner has been unable to get even his own caucus to any kind of majority consensus, rendering the House effectively neutered, apart from its ability, now possibly weakened, to blow the whole system and economy apart. Since when does a Speaker who cannot even do that get to carry on in his job? From the country’s point of view, that means total stalemate for another year, as immigration reform languishes, infrastructure crumbles, and future entitlements and taxes remain untouched. More to the point, Boehner has been exposed as lacking any core convictions himself. He’s not a leader; he’s a rag-doll tossed around by roiling factionalism in his own ranks. He commands no wide public support; and his entire job is essentially keeping his own job. To my mind, that is unacceptable and after this disaster, he should quit, if he has any self-respect. [Boehner] may not command the power of his predecessors, who were able to parcel out earmark spending projects. He may have an unusually petulant and impractical caucus on his hands. But he still has some power to push back—to challenge his critics, to rally his own supporters, and to appeal to the public at large. Standing up to his party’s right wing would have meant risking ouster, but sometimes that’s what leaders do—they take controversial stands and dare their followers to undermine them. Boehner didn’t do that. Instead, he accommodated the Tea Party and waited until the very last minute before defying them, in the hopes they would understand he had no choice. 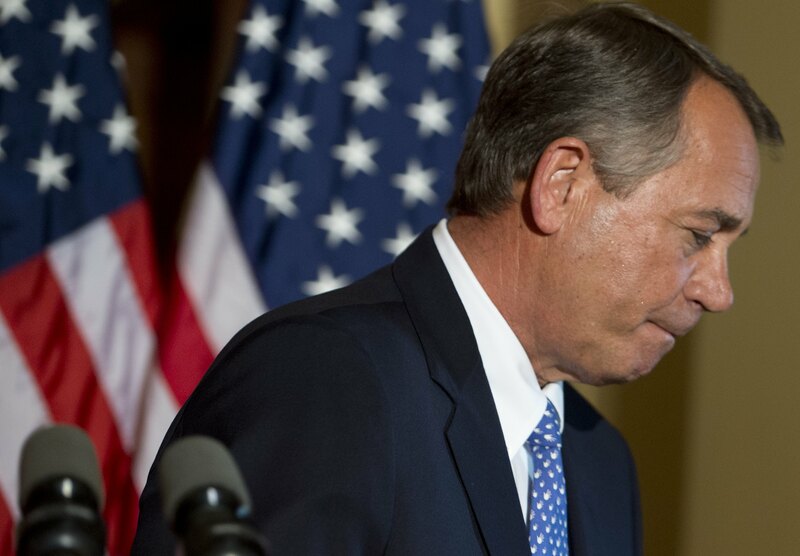 The gambit will probably work for Boehner, just as it has before: He’ll get to keep his job. But the rest of the country is paying a price. And this is not leadership. It’s simply pathetic. Next Next post: Will Cruz Put Up A Fight?